The Langtang Festival and Bus Extravaganza! One of the dangers of travelling alone is that it becomes very easy to postpone making decisions. After finishing the Annapurna Base Camp trek and getting comfortable in Pokhara, I was definitely falling into this trap. The decision looming was to either head directly to India or to go back to Kathmandu and then off for one last trek. My indecision was supported by a mild sinus infection that kept me thinking “I will see how I feel tomorrow”. 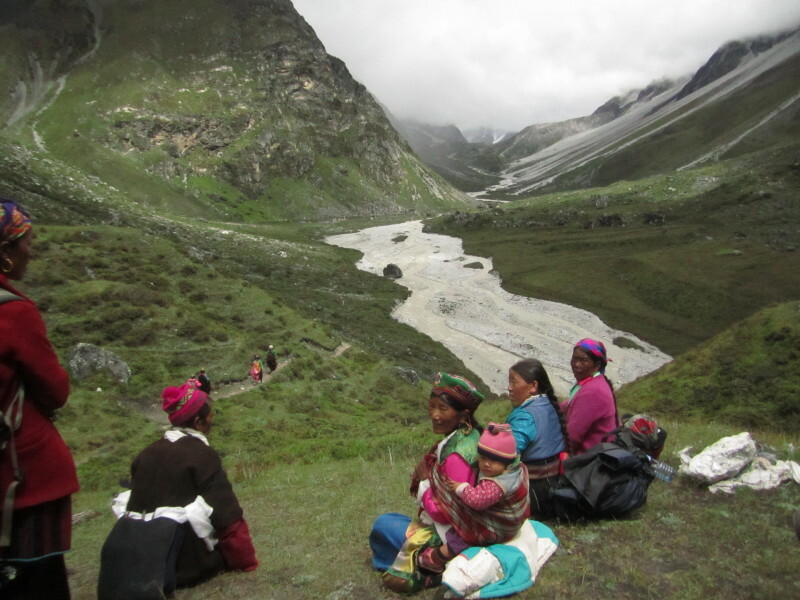 Finally, I had made up my mind; I was heading to Langtang to trek into the mountains along the border of Tibet. It turns out that my indecision and the timing of my eventual decision were absolutely perfect. I met up with Jan (from my previous Panchase trek) in Kathmandu, we loaded up on food and ditched the unnecessary things from our bags and were off to the mountains just in time for the annual Langtang Festival. I am still not completely clear on the details of the festivals, other than being told that after working very hard all year, the local people gather for 3 days of dancing, singing, prayer, home-brew drinking, very little sleeping and trekking to a remote location and back to celebrate. 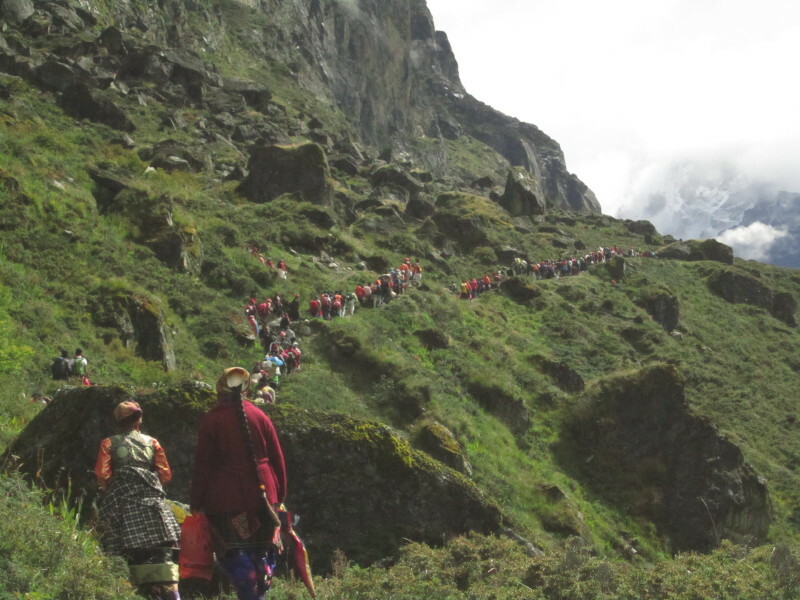 This year, that location was Langshisha, 4 hours walk/dance from Kyangjin Gompa, north-east of Langtang village. The journey began with a 10 hour nerve-racking bus ride over terrain that may have once resembled a narrow road, but is now comprised of sections of compacted landslides, massive chunks of rocks and even occasional speed-bumps. We arrived in Syabru Bensi very shaken and grateful for a long, quiet sleep before setting out on the trek. 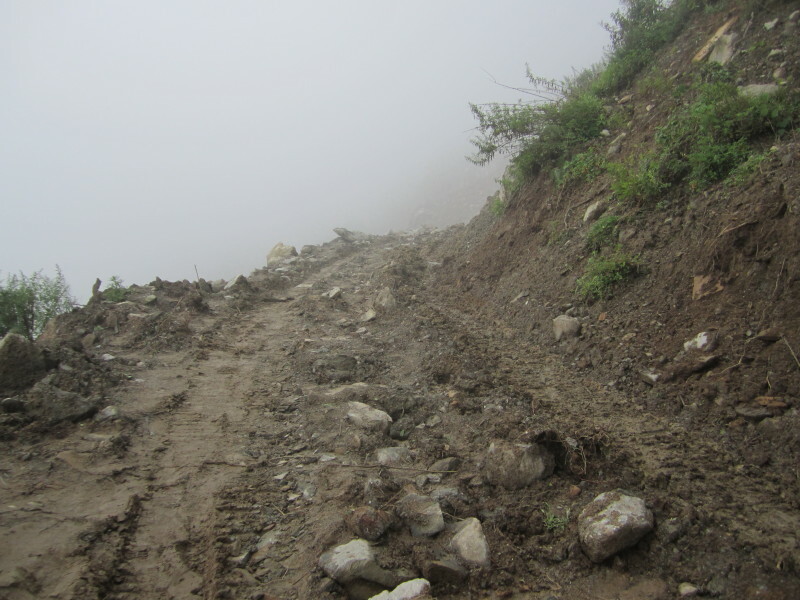 There were two possible starting points to head to Langtang from Syabru Bensi; due to landslides on the lower section, we chose the upper section. Upper…meaning up, up, up. About an hour into the climb, I began to realize that my sinus infection was not gone, but rather back with a vengeance. It even got to the point that I was considering turning around due to the intense throbbing in my head. However, Jan persuaded me to go on and was patient enough to go as slowly as I needed. We crested the hill around lunch and stopped in Sherpa Gaun for a rest. This was extremely exciting for me as I had spent 6 weeks learning about the beauty of this village from Dhakpa, one of the amazing boys at Manjushri Monastery. 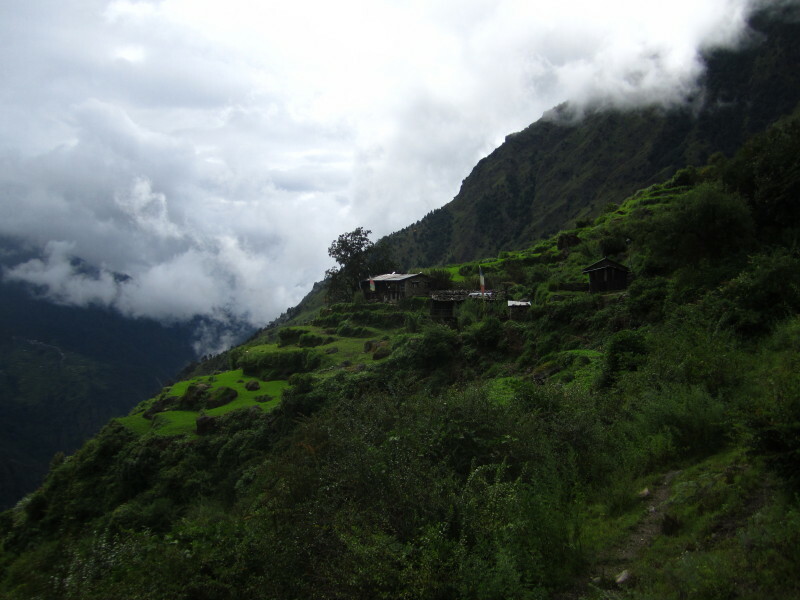 It is a stunning small village perched on the edge of the hill overlooking the lush valley at about 2500m elevation. After resting and refuelling, we descended to Lama Hotel alongside the river for the night. Early the next morning, we were off again, hoping to get at least as far as Langtang. I loaded up on paracetamol and was sort of good to go (again, very slowly). There were a number of times during the trek when I had to remind myself to ignore my headache and focus on the incredible environment surrounding me. 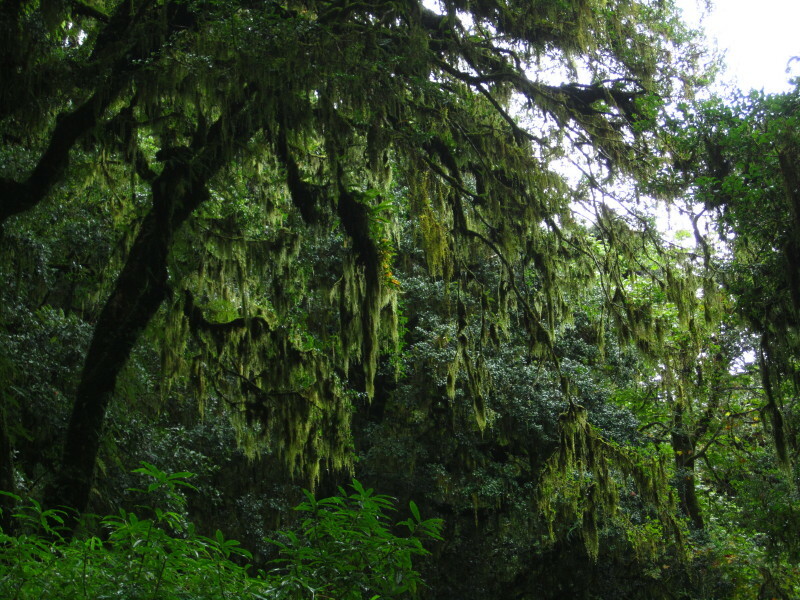 The forests were full of trees that seemed to be dripping with moss and ferns, the river was raging with glacial melt waters, the birds and other animals chatted away oblivious to our intrusion, and even the air seemed to take on a new quality (although I couldn’t smell anything…silly sinuses). This was truly a beautiful trek. By the early afternoon, we had emerged from the forest into the high elevation fields. 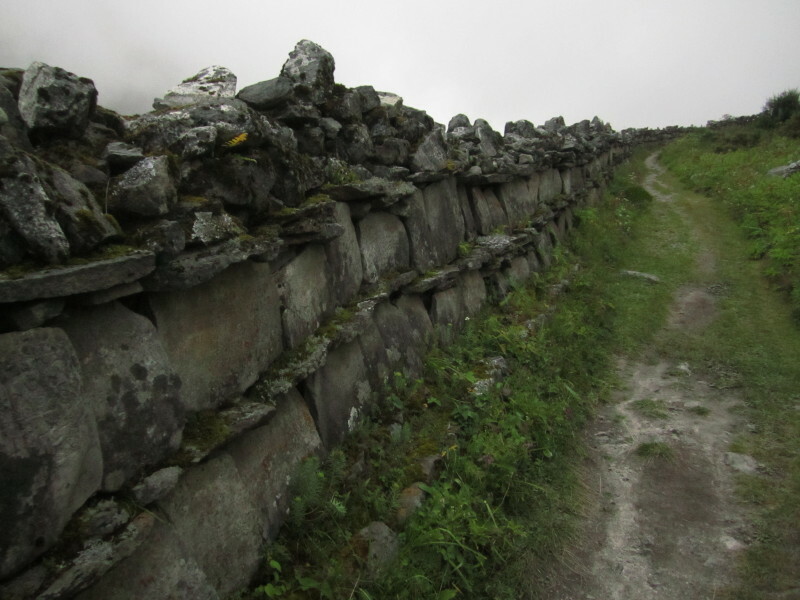 Each village was preceded by a line on stone Mani piles inscripted with Buddhist mantras to guard the towns and offer safe travels to those that pass. Although we had climbed back up to over 3000m, the mountains were still soaring over us reminding us of how small we actually are. Arriving in Langtang earlier then expected, we found the old village to be an enchanting collection of stone and wood carved houses with more stone walls and pathways winding between them. However, this was not the final destination, so on we went up to Kyangjin Gompa at 3800m. Approaching this last village, we were surrounded by massive rocks protruding out of the mist with the sound of singing luring us to upwards. We arrived and immediately headed to the Gompa to get our first encounter with the festival. There were people in the courtyard dancing and singing, people in the hall also dancing and singing, and people in the kitchen handing out yak milk tea. What a sight! While warming myself with a fresh tea, I was ushered out of the way as the shaman came through to dance to the drums and bless the beer. 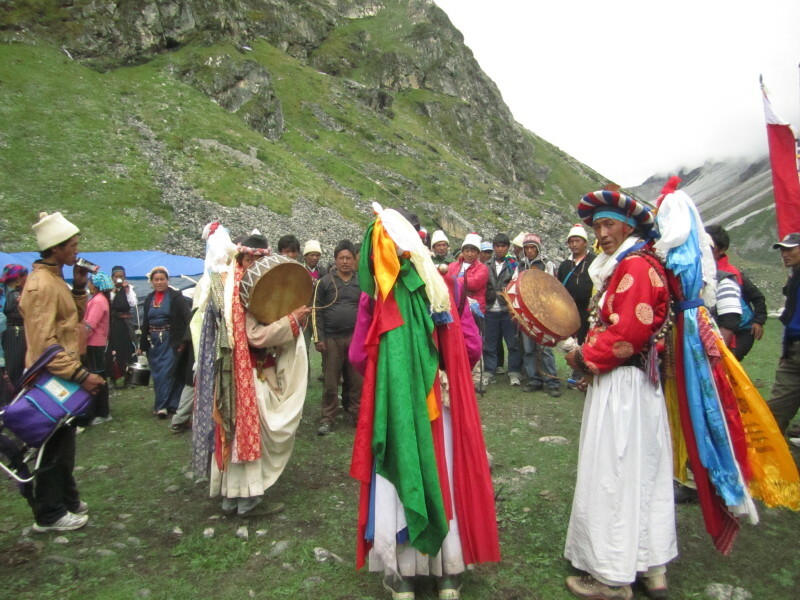 The women, dressed in their traditional Tibetan Diki-la (dresses), joined arms and danced together while the men (mostly in western clothes) did the same. It was soon time to get out of the sweaty trek clothes and settle in for the night, but the festival continued on all night. The next morning, I decided to ignore my desire to stay in bed and recuperate and instead head out on the 4 hour trip up to Langshisha with all of the villagers to witness the main event of the festival. We walked in a long line of colourful dresses, North-Face jackets, and swaying braids (seriously, these women have the most impressive braids I have ever seen) to the sound of the same song repeated over and over with different lyrics each time. There were a few rest stops for food, Raksi (alcohol made from millet) and Chhaang (beer), but the dancing and singing never stopped. Arriving at Langshisha we were again greeted with hot yak milk tea and watched as each group arrived, danced, drummed and celebrated. There were 6 of us Westerners floating around at the festival and about 600 Nepali/Tibetan revellers. This is not an experience I will soon forget. Inside the stone house, there was puja with the local Lamas, up on the rock, there were prayer flags being hung, around the smoking evergreen branches there was dancing and everywhere there was excited (possibly a wee bit drunk) conversation and singing. We were invited to spend the night numerous times, repeatedly being told that the cold wouldn’t matter because no one sleeps anyways. However, the idea of a warm bed and painkillers back in Kyangjin Gompa was too much to pass up and we headed back to the village for the night. After a glorious do nothing/rest and recuperate day I was still not feeling very well. I decided to skip the trek down to Kathmandu via Gosainkunda and instead head back to Syabru Bensi and take the bus back. So, after 2 more days of trekking down, I was ready to get on the bus, or so I thought. 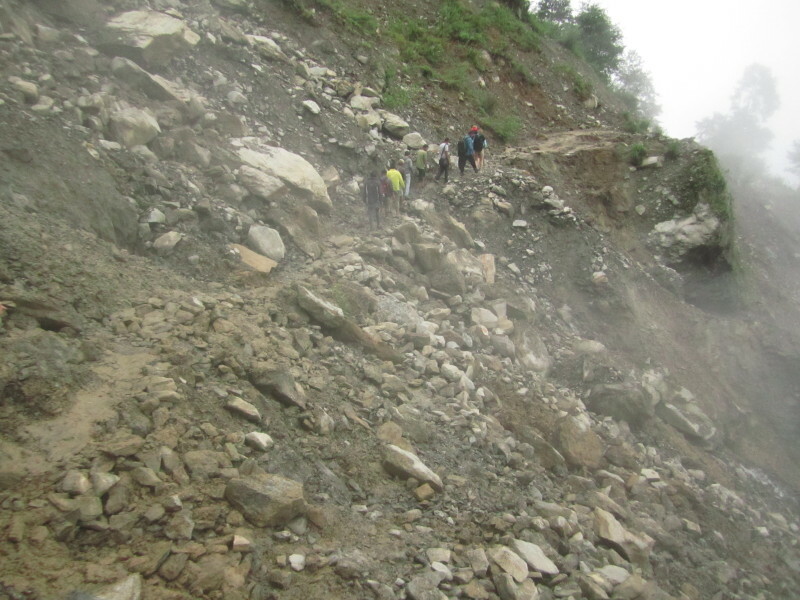 It turns out that while away, there were a number of fresh landslides which made the journey even more exciting than it had been on the way up. The bus wasn’t able to make it to town, so a group of us again went for a little 40 minute trek up over a landslide and a hill to the spot where the bus was waiting. We then stopped in Dunche for a tire change and then stopped again in Ramche for a 20 minutes walk over a landslide to a bus waiting on the other side. Just at the end of this walk, the Nepali men on the other side started yelling at me to get over quickly. It seems that the ground was not quite settled and a few rocks were breaking loose. We got on our new bus for a few minutes, then were again stopped at a very fresh landslide. After two hours of watching a backhoe cleverly recreate the road, we walked across the damaged area and looked back through the mist as our bus made it’s attempt. It managed to round the corner and charge the hill, but couldn’t get the whole way up, so the men gathered, tired a rope to the bus and pulled it the rest of the way over the rubble. Thankfully, this was our last serious landslide, but there were a few other spots where we were unloaded and walked across the dangerous sections so the bus could come over empty…just in case. After 12 harrowing, bumpy, and somewhat painful hours we were back in Kathmandu. I immediately dropped off my bag and headed to the pharmacy for antibiotics and painkillers. I am not usually a fan of medications, but there comes a point where it just seems like the last choice. However, I comforted myself by stopping off at the bakery and picking up some chocolate cake and a bottle of sprite before settling in with my meds and a movie…a perfect evening followed by 14 beautiful hours of sleep. This was the last major outing of my time in Nepal, which means that I will soon be off to India. I have had 3 amazing months in this country and will be very sad to leave. However, new adventures await! This entry was posted in Nepal, Traveling and tagged Bus, Festival, Landslide, Tibet, Trekking. Bookmark the permalink. 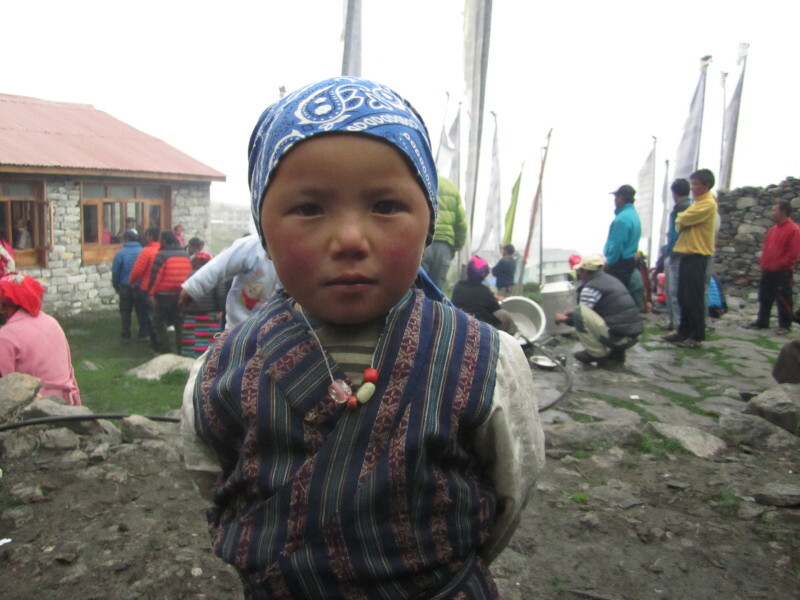 3 Responses to The Langtang Festival and Bus Extravaganza! Photos are amazing!!! I didnt like the look of the road and am just glad you made it back safely!!! That place seems just amazing, have a great trip to your new destination wherever it is.